Lew Church | 7/25/2018, 2:06 p.m. Demonstrations have taken place in 700 cities, so far, protesting the so-called 'zero tolerance' immigration enforcement policy of the Trump-Sessions axis in Washington, D.C. Despite this, Trump and his loyal acolytes continue to dismiss and demonize immigrants in general and the so-called 'Dreamers' in particular. 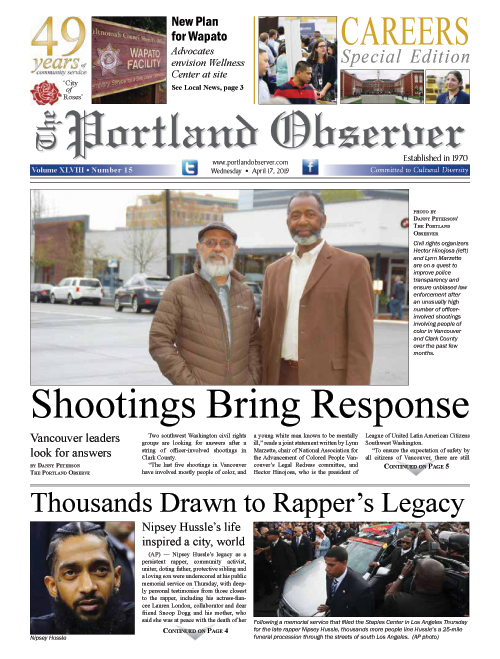 The excellent op-ed ("Abolishing ICE Isn't Radical -- It's Rational," Portland Observer, July 11, 2018 issue) by Fizz Perkal correctly points out ICE "has become a menace." At Portland State, our new student body president, Luis Balderas, is a Dreamer, and we continue to support the Dreamers, the sanctuary movement, Portland’s Occupy ICE protest on Southwest Macadam, and efforts by Sen. Kirsten Gillibrand, D-N.Y. to abolish ICE altogether. ICE is now, under Trump and Sessions, nothing more than a deportation agency. A fundamental question, often ignored by Trump supporters, is why people decide to become refugees to start with. What would make someone risk life, limb and the safety of family members to pick up and travel 1,000 miles or more to look for "safe space" to the North? In large part, refugees run away from harmful situations where gang violence, an abusive spouse or parent, or political conditions threaten the well-being of people on the ground. Refugees are desperate and afraid. I can't pretend to know what it is like to flee violence in countries like El Salvador, Guatemala and Honduras in Central America. But I know a little about running away from unsafe situations. Growing up in an abusive household, there was a great deal of sexual, physical and emotional violence going on against women and children. As a 12-year-old, I debated with my 9-year-old brother whether it was "safer" to run or to stay and stick it out. If I ran, I might be safer, but who would protect my younger brother? The first time I ran away, I took a sack lunch and a teddy bear from mom (who had recently passed) and rode my bicycle down a California highway at 12 midnight. Corralled by a patrol car that night, I spent three weeks in juvenile hall, where my best friend was Billy Simpson, also 12, who was "in" for strangling cats. By my actions, I did get my custody awarded to three adults including Bob and Nancy, who I hoped might be safe foster parents. But that situation didn't last long. On my second runaway effort, I wanted a bigger, better plan. On a Greyhound bus, I crossed several state lines, from Nevada to Arizona, Utah, Wyoming, Montana, and then to Idaho. In Idaho, I spent a month in the Sandpoint County Jail, a few miles from the Canadian border. I wouldn't tell the sheriff or his wife my real name, but his spouse did make home-made meals for those of us lodged in his 5-cell jail. Today, however, in Estados Unidos, not only has the Trump Administration targeted Dreamers, threatening to end the DACA program for ASPSU president Luis Balderas and other Dreamers, but we have also seen Trump’s policies separate parents from their children -- families that want to stay together.